Chinese swimmer Shen Duo was allegedly involved in a warm-up pool altercation yesterday, August 23rd, at the Asian Games. Joseph Schooling kicks things off tonight, looking to add a 50 fly gold to his 100 fly win from earlier in the week. 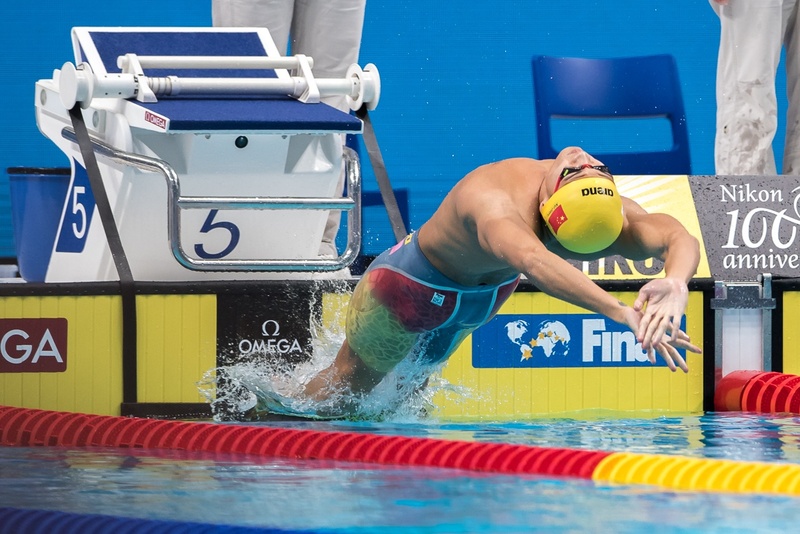 In other men’s action, China looks to maintain its sweep of the men’s freestyles, with 50 free champ Yu Hexin leading the 100 free in a prelims tie with Jordan’s Khader Baqlah. Japan’s Satomi Suzuki set an Asian Games record this morning in the 50 breast, going 31.02, and she’ll battle for gold tonight. The night will finish with the women’s 4×100 medley relay, where Rikako Ikee will try to power Japan to another relay title, though China is lurking about a second behind after prelims. Keep refreshing this page for live, event-by-event updates of all the action from Jakarta. Singaporean star Joseph Schooling took home his second gold of the 2018 meet and his 7th career Asian Games medal with a 23.61 win in the 50 fly. The win was much closer than expected for the Asian record-holder, with China’s Wang Peng just .04 seconds back with the silver medal. Both Schooling and Wang cut about two tenths from their prelims times. While the race was good, the times were not – they rank well outside the top 30 in the world this year. On the other hand, another gold for Singapore should put them just one medal behind South Korea for third overall in total medals. Kazakhstan’s Adilbek Mussin won bronze in 23.73, just the second medal of these Games for his nation. He narrowly beat out Shunichi Nakao (23.88) of Japan and Li Zhuhao (23.89) of China. Japan’s Satomi Suzuki broke the Games record for the second time in a day, going 30.83 to win the women’s 50 breast. Suzuki becomes the first sub-31 Asian Games champion and is now within a half-second of the overall Asian record. Like Schooling in the men’s butterflys, the 27-year-old Suzuki has now swept the 50 and 100 breaststrokes at this meet. Japan was set to sweep silver and bronze, but second-place Miho Teramura was disqualified from the event, bumping Singapore’s Ru En Roanne Ho to the silver medal. Ho, 25, gives Singapore its 5th medal, tying South Korea in the overall medal table. China took third and fourth with Feng Junyang and Suo Ran. Feng was the bronze medalist in 31.24, with Suo’s 31.42 finishing just outside the medals. 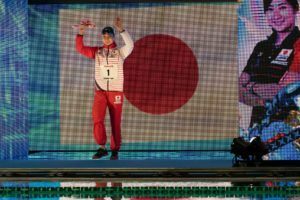 Though China had swept all four men’s freestyle golds so far, Japan broke through for not just gold but silver in the men’s 100 free. Shinri Shioura tore to the win in lane 3, with Katsumi Nakamura coming from his outside in lane 2 to pick up silver. Shioura was 48.71 and Nakamura 48.72. Neither swim was a season-best. Shioura was 48.68 at Pan Pacs and Nakamura 47.87 at the Kosuke Kitajima Cup. 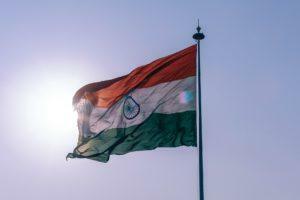 But they got their hands on the wall first, breaking up a Chinese sweep in the men’s freestyles and maintaining their nation’s narrow lead in the medal table. 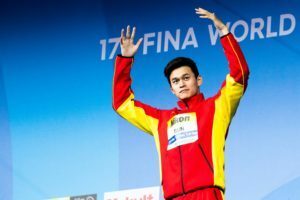 China’s Yu Hexin, who won the 50 free earlier in the week, fell to bronze in 48.88 – he, too, was 48.6 earlier this year. China also took 4th with Hou Yujie (48.95) and Jordan’s Khader Baqlah was 49.10 for fifth. 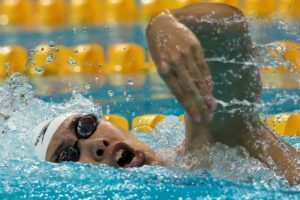 China’s 16-year-old sensations dueled for the 800 free title, with the slightly younger of the two coming out on top. Wang Jianjiahe was 8:18.55, swimming away from Li Bingjie for a nearly-ten-second victory. That’s the second time this year that Wang has swum an 8:18 – she was 8:18.09 in March and sits 5th worldwide. The gold pairs with her 1500 free win earlier in the week and leaves Wang with three golds so far. (The third came as part of the 4×200 free relay). Wang also breaks the 8-year-old meet record. Li was 8:28.14 to earn silver and her fourth overall medal. Li won the 200 free and was on that 4×200 free relay, while she’s been second in the 800 and 1500. Japan was third and fourth with Waka Kobori (8:30.65) and Yukimi Moriyama (8:40.71). China’s Xu Jiayu capped a sweep of all three backstrokes in Jakarta, going 1:53.99 to win the 200 back. He becomes the third man this season to go 1:53, joining the winners from this summer’s other two major competitions: European Championships (Evgeny Rylov, 1:53.36) and Pan Pacific Championships (Ryan Murphy, 1:53.57). Xu also breaks the Chinese National and Asian Games records. Japan took both minor medals. Ryosuke Irie was 1:55.11, slightly improving his 1:55.12 from Pan Pacs. He now sits #4 worldwide this season. And Keita Sunama was third in 1:55.54. China’s Li Guangyuan (1:57.13) was fourth as there was a big dropoff between each position after the medalists. 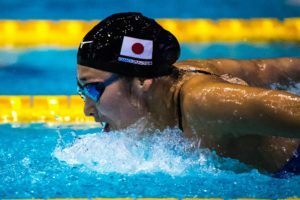 Japan tore through the field to win the women’s medley, giving them golds in two of the three women’s relays this week. Once again, Rikako Ikee was the powerhouse, splitting 55.80 on fly, but Japan also had 100 breast champ Satomi Suzuki (split unlisted) and 100 back champ Natsumi Sakai (59.42 leadoff) to go with 100 fly champ Ikee and anchor Tomomi Aoki. The Japanese team went 3:54.73, blowing out the field by almost five seconds and smashing the Asian Games record by more than three. China was the only other team under four minutes, but were disqualified out of the silver medal spot. No splits were available, but China started the team of Chen Jie, Shi Jingin, Zhang Yufei and Zhu Mengui to go 3:59.51 before the DQ. Korea beat Hong Kong by about eight tenths of a second in what looked like the new race for silver, but Korea, too, was DQ’d after going 4:02.33. Hong Kong was 4:03.15 and ultimately bumped up to the silver medal with the team of Stephanie Au, Jamie Yeung, Chan Kin Lok and Camille Cheng. Singapore’s 4:09.65 moved all the way up to bronze medal status. Schooling won. 23.61. That’s slow.. His strokes is sluggish. Neverthless a Gold still. LOL the time is slow, I was expecting low 23 and GR too. I guess the 100m Butterfly and the 4 x 100m relay yesterday night did wear him down a little. Good Medal upgrade from 4 yrs ago though. Yes. He told the media that he was tired after yesterday 100 fly and relay. 50 fly is usually the first day in World Championships that’s why he can swim a sub 23 in 2017 Worlds. If Schooling were not a product of the NCAA might be acceptable. He is use to swimming 13 SCY events in four days. And now he’s tired after two event on the same day? Maybe he ate too much junk food and fizzy drinks the past two days after winning relay medal and 100 flu gold. Really surprised he wasn’t at least 23.2. For Schooling to be 23.7 in 50 and 51.0 in 100, that’s a way better 100 than 50. That was too close! And slower than I expected, but at least he won and defended both titles from 4 years ago. He didn’t win the 50m butterfly 4 years ago. You’re right. He won silver, behind Chinese swimmer Shi Yang who is nowhere to be seen. So Schooling has upgraded his silver to gold. Yup – 50m was won by China four years ago. Schooling had a silver in this event four years ago. That was a perfectly executed swim. Why the 2nd Jap gal was DSQ? So it’s Ho getting the silver now. I must be blind.. Could you show me which part of that video showed her doing multiple dolphin kicks? I watched it a few times and couldn’t see it. Thanks! Hey is ok I see it now. She’s the one in the far right with an extra kick. Glad to see they are clamping down on this! The one in lane 5 also looks like she had an illegal kick too.